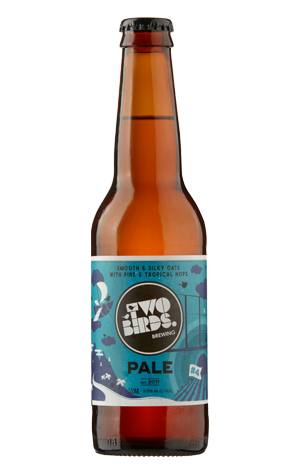 The start of 2017 was a pretty momentous one for Two Birds Brewing. With the opening of their in-house packaging line, they completed the multi-stage transition from contract brewers to "everything under one roof" brewers. To mark the occasion they introduced a new look, with all of their labels now coming with a story told via the artwork, and a new beer too. The new beer was a reworking of a previous beer, Oaty McOatface. Originally released as a draught only beer in late 2016, it returns with more oats and a tweaked hop bill as the core range Pale, replacing the retired Bantam session IPA. The result is a very pale beer dominated by tropical hops (aroma and flavour wise) with a little sherbety sweetness, a full body that stops short of being creamy and a finish that's more dry than bitter. Bantam at its best was a joy, but the beverage formerly known as Oaty should ensure it's not missed.